Official counterfeit education, awareness & protection. To help ensure you are buying authentic UGG product we utilize the latest security features. Every authentic UGG and I Heart UGG product comes with a security feature contained in a reflective security label sewn into the left shoe and/or a security sticker on the box. If your product has a material content label sewn in, it will also have a security label sewn in behind the label on the left shoe and will work in the same manner as the sticker. If there is no sewn-in label, a security sticker will be on the sole of the left shoe. For some infant and toddler shoes, the reflective security sticker is adhered to the insert card included in the box. 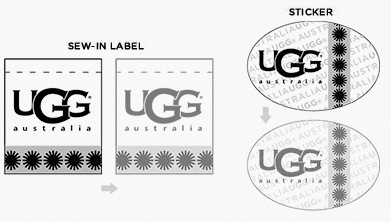 In Fall 2013 we modified our security labels to help ensure UGG® product is authentic. The new security label (behind sewn in label of the left shoe) utilizes a QR (quick response) code that can be scanned by any smartphone. When scanned, the QR code will take you to an uggaustralia.com landing page that verifies the product as genuine UGG. On both the sticker and sewn in label, the holographic sun logo will change from black to white when rotated 90 degrees. On both the sticker and label, the holographic sun logo will change from black to white when rotated 90 degrees. Additionally, the security feature utilizes “rolling optics.” Turn the label or sticker and you should see the UGG logo rolling over the suns with an optical illusion of depth (3D). 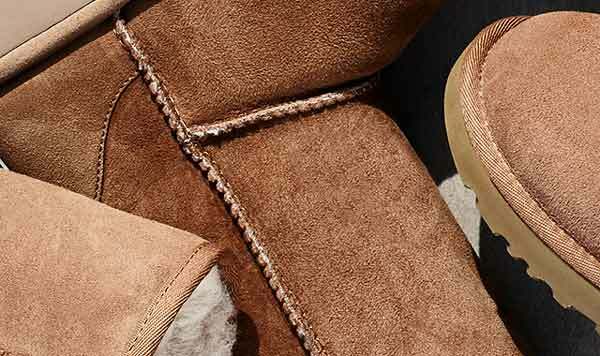 Additionally, on both the sticker and label, the UGG logo will appear when turned at an angle. Some Fall 2014 merchandise has been produced without the holographic sun logo on the sewn-in label. Please scan the QR code to guarantee authenticity. "Beware of Text Messages: Currently UGG does not contact customers via text message regarding promotions and special sales and we will never do so without explicit permission. Should you receive such a text message, please disregard as it is most likely from a counterfeiter and part of a scam."